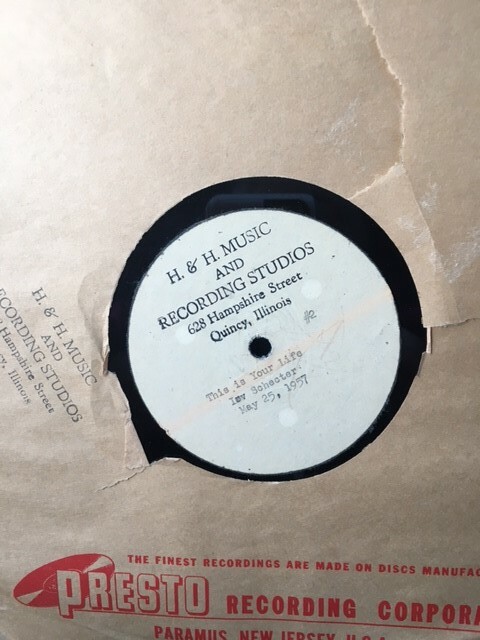 After his dad, Jim, died last year, Ted Johnson was cleaning out his father’s possessions, when he ran across an LP album. The record label was titled, “Irv Schecter: This is your life.” It was recorded in 1957, by H & H studios, 638 Maine St., Quincy IL. Irv (my dad) was 33 years old. Yours truly was almost two. Ted brought the LP to me at work, still in its original simple album cover, made of brown craft paper. We have a turntable in our storage room; I had little confidence it still worked. Instead, I got the material transferred onto CD. When I popped the CD into the car player, my world stopped. In the 1950’s, my parents, apparently, were in a social group, which occasionally, surprised someone with voices from his or her life. They picked Dad; the committee put Mom on task to contact each person, who could speak to Dad’s life from each stage. Friends and relatives were recorded when they called in, or their letter was read. The LP sound quality was a bit scratchy, due to age. Still, it was easy to recognize familiar voices as the emcee played each piece to roast and toast him. Every person was introduced, in chronological order, from Dad’s past. Their names were withheld, so Dad had to identify them by voice. 1. My paternal grandparents. Sadly, I couldn’t remember Grampy Sam Schecter’s voice. He died when I was young. Grandma Schecter’s voice was a different story. Her Russian accent and voice tone rang loud and clear in my brain! 3. Next, was Aunt Pat, Dad’s sweet, sister, with a small shoe size (4.5!) and a big New York accent. 4. Several childhood friends were followed by fraternity brothers, from The Ohio State University. More than one guy joked that dad owed him a bit of money. 5. Dr. Ben Kimmelman, a dentist from California was the heart stopper. Ben was a fellow P.O.W. in World War II, during the Battle of the Bulge. The miracle that these two buddies survived was not lost on the audience. Dad’s comments, interjections and craughter (crying from laughter) were something to experience again. I envisioned him being a good sport, as he threw his head back in full-out laughter, as if to say, “You got me GOOD!” And they had. Here I was driving around town with a car full of memories. What a gift. Ted’s trash. My treasure. The mystery of why Jim would’ve even had the LP is puzzling. The fact that Ted could have easily tossed it out –but didn’t – is another puzzle. First, our fathers were definitely acquaintenances, as most Quincy businessmen were and are. But other than that commonality, the only other connection that I know of is the fact that both were residents at the Veteran’s Home on the same floor, until Jim passed away recently. Remember this simple gesture when weeding out your own homes or those homes of others. You may give someone the gift of a lifetime…literally. Thanks Ted. I’ll never forget this. Where were the guidance counselors when I signed up for classes? Where were my parents? Who let me avoid some of the most important subjects of my foundation? In short, I was afraid of being bored, a classic teenage fear! Now, it makes me angry, that as a fifteen, sixteen, and seventeen year-old, I was entrusted with choosing the right schedule. Instead of enrolling in Brit Lit, American Lit, or World Lit, I opted for Creative Writing and Mythology. Good grief. I feel like such a slacker. Jacquelyn Mitchard (Deep End of the Ocean) once had a weekly syndicated newspaper column. Every Wednesday evening, I devoured her wit and wisdom, especially her column titled, “Read These Classics Before You Die!” Eleven all-time-must-reads were on the list and, at that moment, I wondered if I had a chance to make a dent. A Tree Grows In Brooklyn was my first book. Check. To Kill A Mockingbird. Check. Catcher in the Rye. Check, check. Sadly, I do not read very fast and am easily distracted by current best sellers. My bedside stack of books continues to grow. My family passes good reads my way, with the enticing words, “You’re going to LOVE this one!” If only I could finish books by sliding them under my pillow at night. There is one bright spot in my delayed reading curriculum…as an adult, I am enjoying the classics more than I ever would have, as a teenager. Last week, I read Hemingway’s, Farewell to Arms. My husband said, “What? You’ve never read THAT?” I read much too slowly to read things twice…although, there are some books which I would love to read once a year. This week I am reading Three Cups of Tea and (yes, and) Hemingway’s Garden of Eden. I am becoming a huge Hemingway fan. The simple dialogue is very creative, if that makes sense. Old Man and the Sea was my first Ernest book, so I had no idea that Farewell and Garden would be so sultry. Perfect summer reading. Did you catch the part that I am reading two-at-a-time? This is only possible because of books-on-C.D. from our public library. I do not feel like I am cheating by listening, as opposed to reading the written word. On the contrary, it is absolutely delicious to hear the story read as it was intended to unfold. I’ll never totally conquer the classics, but with two-at-a-time, I can certainly make some progress. Now, if only the community college offers a speed reading course, for audit only-not a grade, please, maybe I can knock out three-at-a-time! Parents, guide your children. Counselors, guide your students. Administrators, require the classics.